Have a bunch of minifigs, and you don't want to put them away, but you need them handy for a MOC? Or perhaps you'd like a little LEGO themed art? The kind folks over at Go Figure Displays sent over some of their LEGO themed products to the West Coast outpost of Brickset Towers, and today we'll take a look at them. Go Figure Displays is run by a husband and wife team in New Hampshire, and they've been selling LEGO themed products since 2016. All the products are made from Poly Lumber, which is made from recycled milk cartons. I found the material to be very lightweight and quite durable. Their Brick Script letters are just what they sound - letters meant for hanging on the wall that have LEGO bricks embedded in them. A close look at the bricks shows that they are authentic LEGO bricks - I originally thought they were plates, but Chris Sporcic, owner of Go Figure Displays, informed me that the full sized bricks are easier to slot into the rectangular slots of the displays. 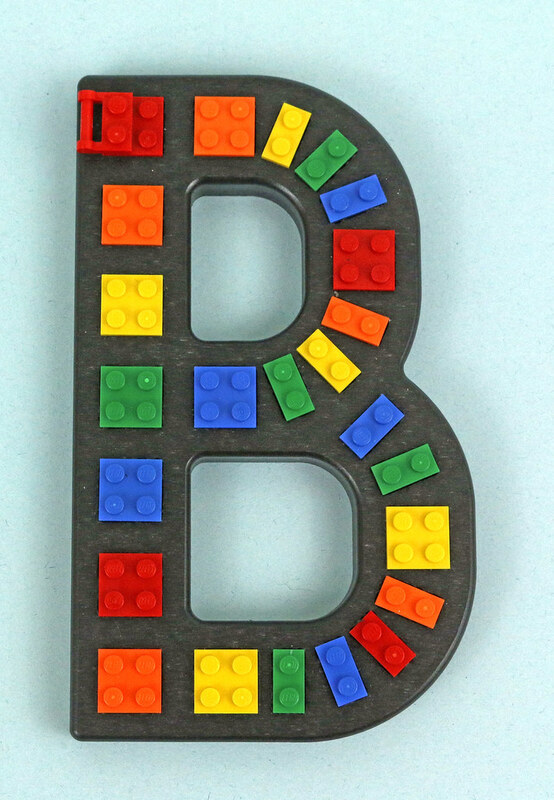 Typically the display spell a name or initials, though I received just one letter - B - for Brickset, of course! It's recommended to hang the letters by using Scotch foam mounting tape to attach them to the wall. I found this to be a very secure and easy method, and the letters remained hung on a variety of wall surface for an extended period of time. Magnetic tape can also be used to put the letters on a magnetic surface, such as a refrigerator. The Poly Lumber is lightweight enough that the tape supports the weight of the letter without problems. 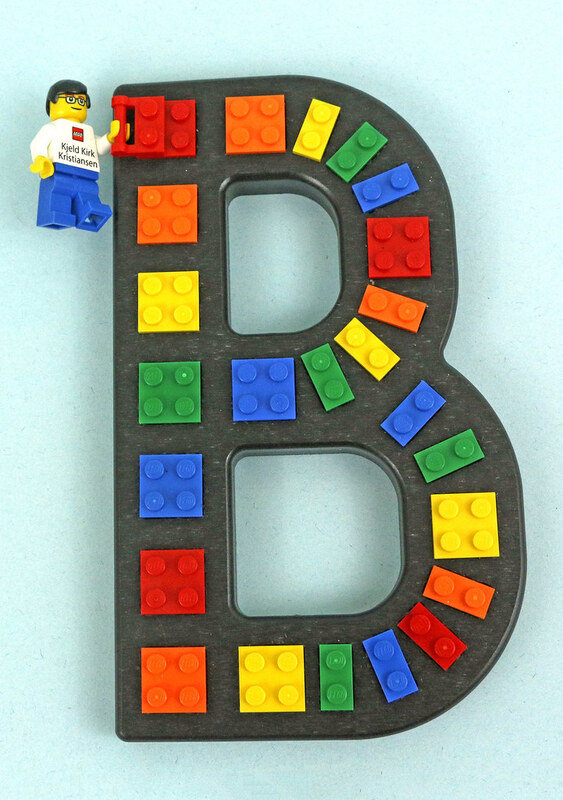 There's a 1x2 plate with bar included with every letter in case you want one of your favourite minifigures hanging around. 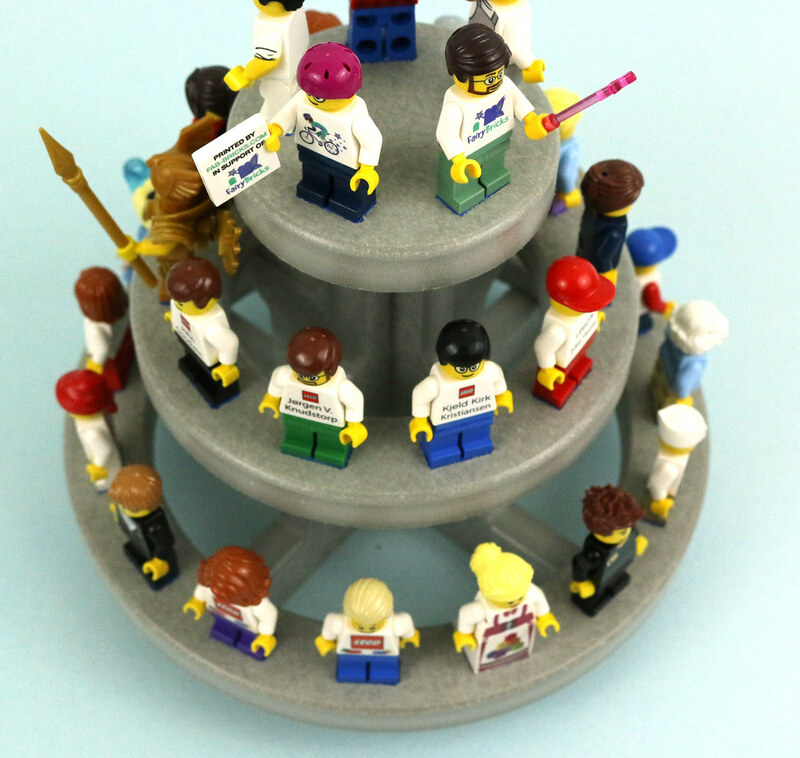 There are a number of different minifig stands available at Go Figure Displays website. 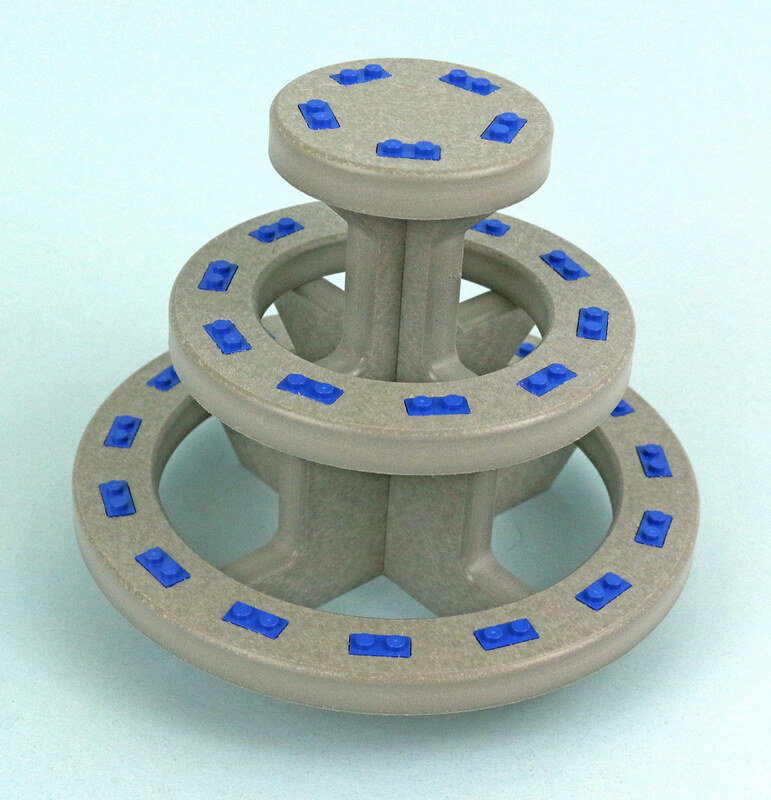 One of the first stands Go Figures started producing is a three tiered circular stand. 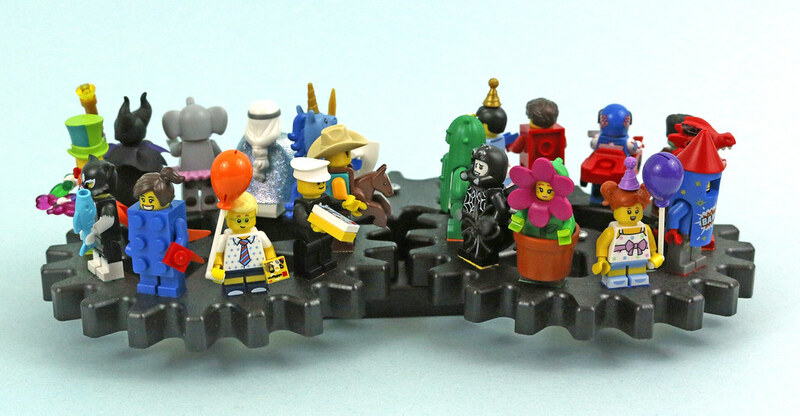 Each of these circular stands can hold up to 30 minifigures. 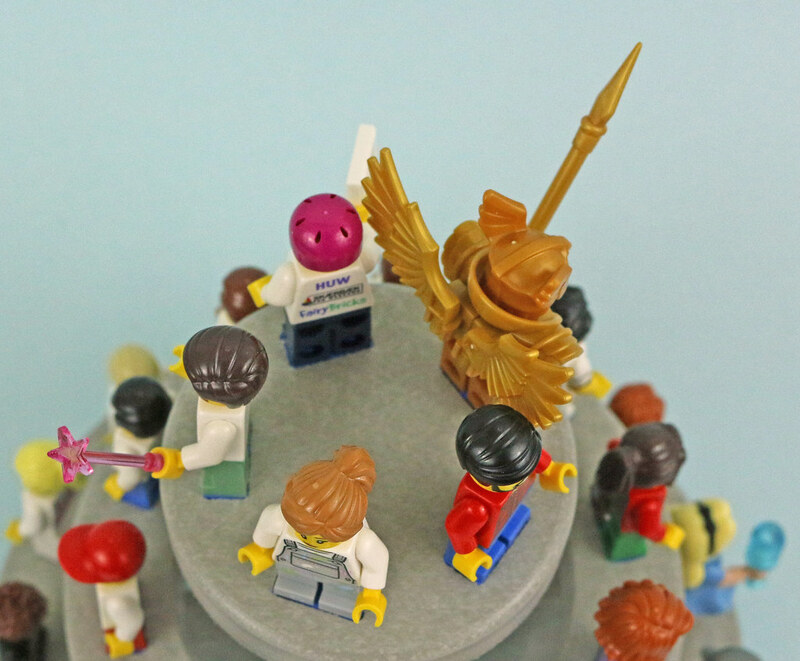 I pulled together some of my favourite minifigs to populate this display. Please note the very collectible Huw minifig from last year's Bikes to Billund (recently fetching record prices on eBay) in a position of honour at the top! For the most part, there's ample room between minifigs for display. However, should you have a minifig that takes up a little more space, room can get a little tight. Adding the Flying Warrior threatens to sweep Huw off his perch at the top. 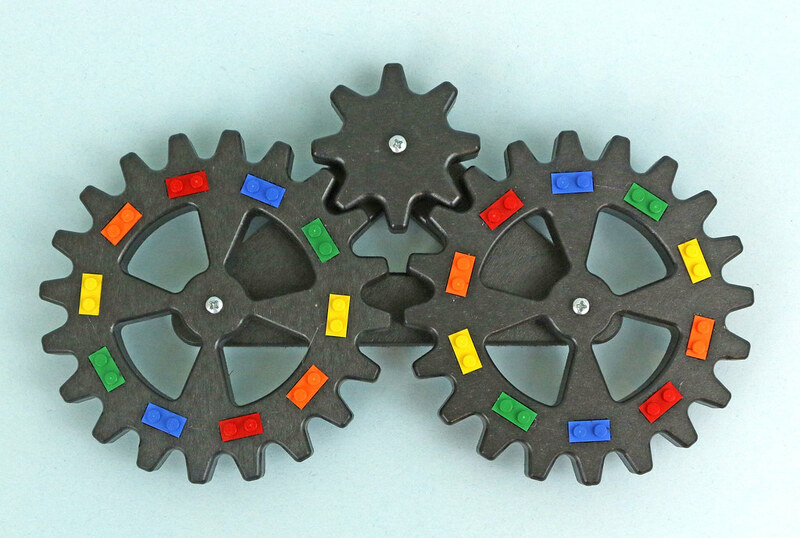 As I'm an engineer, my favourite minifig stand is the rotating gear display! I love the moving gears. These displays hold 20 figures, so I was able to place all of my CMF Series 18 on the gear display, with a couple other additions. By and large there's room for the minifigs to hang out. However, much like the other stand, if you have a minifig that has a more expansive costume, such as Spider Suit Boy, it can make placing the adjacent minifigs a little more challenging. Since LEGO bricks are used in the products, the clutch power in all the products is exactly what you'd expect. For minifig stands, these are great for practical, functional use. I really like that they're made from a recycled material. I found them to be pretty much indestructible - through trying to hang them, I managed to drop them numerous times with no cracks, dents or other damage. Similarly I left them outside, in the rain, in the heat, and they survived none the worse the wear. While this test wasn't planned, the brick letter also survived the nibbling of a little dog who had mistaken it for a toy! For those of you who like to display minifigs for a long time and worry about dust - these probably aren't the stands for you, unless you get something to place over top. Also, if a minifig comes with an accessory - such as the mouse that comes with Elephant Girl - there's no way to display those. I'm currently using the stands to hold many minifigs that I like to use to populate my modular buildings or my winter village - minifigs that I know I'll use again, but don't want to put them away. The letters and stands can be purchased at Go Figure Displays' website. I thought the prices to be pretty reasonable - at the time of this writing the letters are $7.00 each, the 3 tiered stand is $24.00 and the rotating gear stand is $20.00 (all prices U.S. dollars). There are a lot of custom options possible. The bricks used on the stands or letters can be specified to be multi-coloured or a single colour. Different sizes of gears are available that you can use to customize your own kinetic display. If you're interested in the concept but not these styles, Go Figure Displays has other kinds of minifig stands and other LEGO themed wall hangings available. Go Figure Displays does ship internationally for some of their items, though the shipping charges can be accordingly high. For those of us in the U.S., though I think they're a good option. 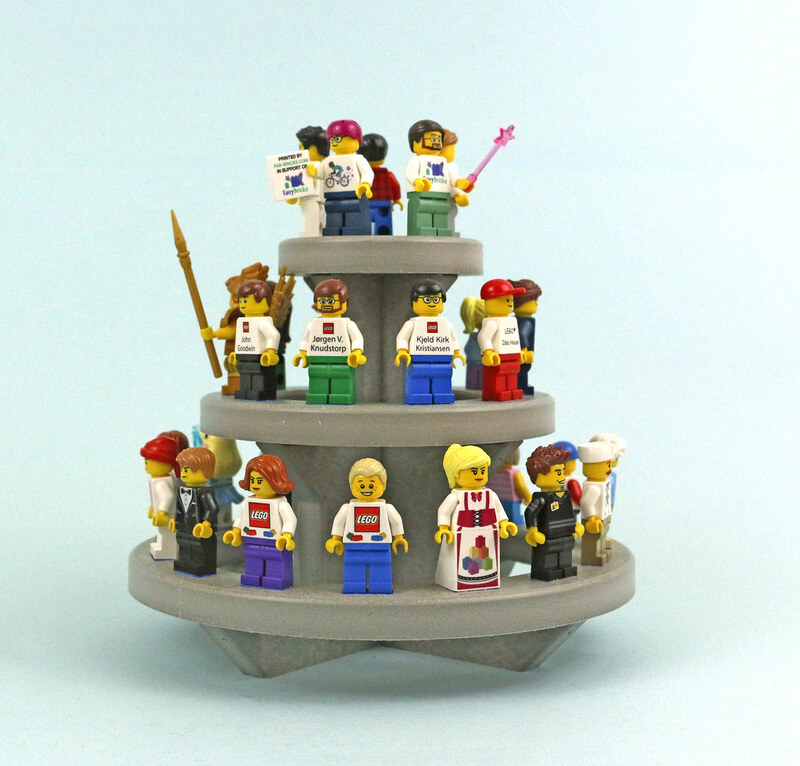 For those of you attending BrickFair in Charlotte this weekend, you'll be able to check out their products in person. Many thanks to Chris Sporcic of Go Figure Displays for providing these samples for review. All opinions expressed are my own. This article isn't loading for me, and it isn't on the main page anymore. Was it deleted? 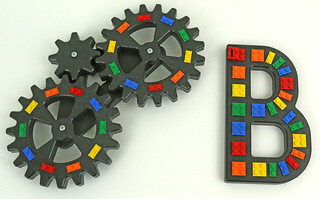 I like the rotating gears. Good and new idea. All I want is that Huw minifigure. Would be nice, but they don't ship to the UK for some reason? Unfortunately doesn’t ship to Canada either. "I managed to drop them numerous times with no cracks, dents or other damage ***required***"
Thanos: "Now this puts a smile on my face." If it only came with the Huw mini figure! Apparently, they don't ship to Canada :/ What a shame. Unfortunately, shipping (plus import duty / customs tax) makes most of the items prohibitively expensive over here, plus some of the more interesting ones (to me) don't ship to Germany at all. Some others do though, and one or two even offer free shipping. Will try out one of those to at least see the product quality in person for myself. I'd love to buy these, but shipping to the UK is too high sadly. I've been collecting the costumed figs recently to create a dance floor, perhaps I could get a couple of those gears and add an actual "dance" function to display them! 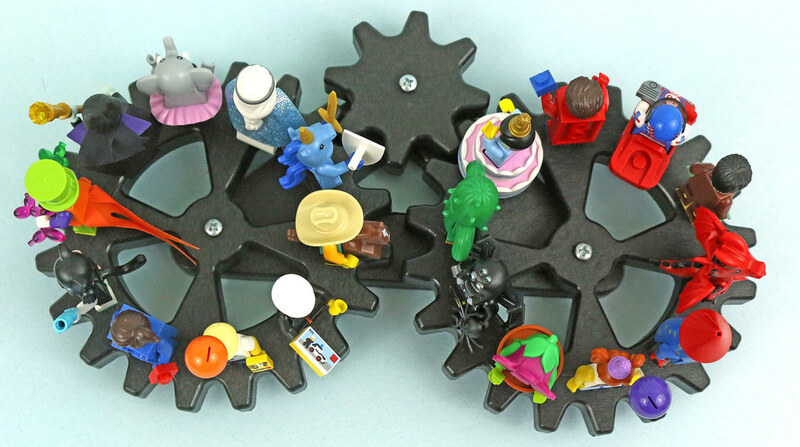 The rotating gears one is screaming "Bat Cave Addition!!" I'm glad to see that you have me on the top pedestal, Megan. What kind of engineer are you? I'm strongly considering an engineering major myself. @Norikins - I'm a chemical engineer. I highly recommend engineering as a career!